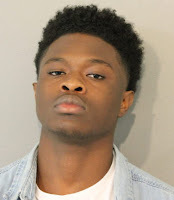 • A La Raza street gang member who’s on parole for possessing a handgun with a defaced serial number was arrested in Streeterville on May 27. Police said officers saw Jonathan Castro and two others drinking in the 200 block of East Pearson near a car with its passenger side door open. An infant was in the car’s rear passenger seat, according to cops. Asked if anything of interest was in the car, Castro—who has “La Raza” tattooed on his face—told officers that there was a gun wrapped up in a shirt on the passenger floorboard, according to court records. Cops recovered a .38 caliber handgun that Castro allegedly admitted to owning. Castro, 22, has been charged with aggravated unlawful use of a weapon - second offense. The Illinois Department of Corrections revoked his parole and he was shipped back to Stateville Correctional Center on Tuesday, according to state records. He will be discharged on July 28. At that time, his bail on the new firearms case will be $50,000 per Judge Michael Clancy. State records show that he was paroled in December after serving half of a two-year sentence for the previous firearms conviction. • A 21-year-old Elgin man told police that he forgot to take his brother’s handgun out of a backpack before taking the bag to North Avenue Beach on Memorial Day, according to court files. William Cage was arrested after cops found a 7.65mm handgun in his bag during a routine search at an alcohol checkpoint near the beach around 5 p.m. on May 28. Cage has been charged with felony aggravated unlawful use of a weapon. Bail was set at $5,000 by Judge Clancy.